In the near future, 3D printers will be as ubiquitous as the 2D kind. At the moment there are two main challenges to putting one in every home: the printers still fairly pricy, and they are not as easy to use as the printers we are already familiar with. As technology forges ahead, the question that people will eventually be continuously asking themselves is "should I buy it or should I make it?" 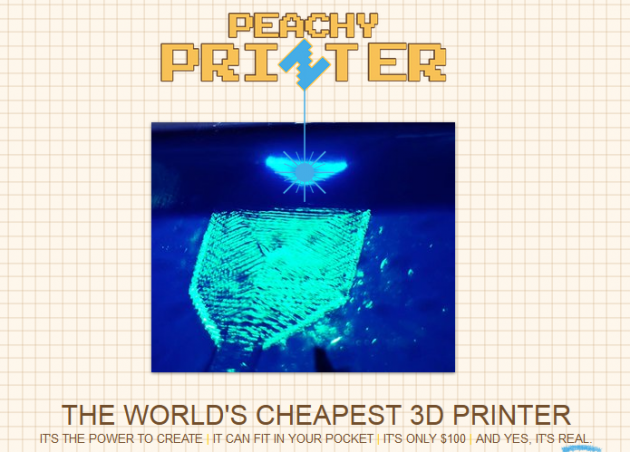 The Peachy Printer/Scanner is one of the first to aims for a $100 price point, and the company has reached its funding goal on Kickstarter. The technology is photolithographic, using a controlled beam of light to turn light sensitive resin into a solid object. When combined with a camera, even your mobile phone camera, the Peachy Printer doubles as a scanner, letting you scan almost any object, automatically create files, then print that object in resin. Whether this particular tech is the one that is going to catch on is far from certain. But from a trends perspective, we have no doubt that 3D printing is indeed coming to the masses.